On a gusty autumn day in Montana's Glacier National Park, I hiked toward the Great Divide through a world shimmering with yellow leaves, burgundy-colored berries and silvertipped bears. First came a female and yearling cub in a forest of subalpine fir, then a loner nosing its way into a serviceberry thicket. A pair of young adults rested high on a limestone ledge. Farther along, a straw-colored female appeared by a turquoise lake. Her focus was huckleberries; for the little cubs at her heels, it was nonstop wrestling. By afternoon, I'd tallied more than a dozen grizzlies. Three days later, I covered the same route and never saw one. That wasn't the first time I wondered how the experts were ever going to come up with meaningful counts of Ursus arctos horribilis, listed as threatened in the lower 48 states since 1975. The U.S. Fish and Wildlife Service recognizes five populations in the states of Montana, Wyoming, Idaho and Washington, each separated from the others and beset by encroaching development. Trying to track their numbers closely is a crucial part of recovery efforts. But grizzlies roam enormous home ranges. During hot weather, they'll feed at night and keep to shady hideaways all day. They also seek out roots and tender shoots, and this, too, often takes them into thick cover such as streamside brush. Sometimes the smartest survey method is to make a wide detour, knowing how seriously these creatures can object to being surprised. Even with statistical formulas and computer models to help fill gaps in field coverage, census techniques in the past have yielded hazy estimates. That changed last September, when a U.S. Geological Survey team stationed in Glacier National Park announced the latest numbers for Montana's Northern Continental Divide Ecosystem (NCDE). Comprised of the park, the Bob Marshall Wilderness complex, and adjoining federal, state, tribal and private lands, it covers an area roughly the size of Maryland and Delaware. The survey team, led by Kate Kendall, put the total number of grizzlies in the NCDE at 765. "The low end of our estimate is 715," says Kendall, "the high end is 831, and the quality of the data gives us a 95 percent level of confidence in those figures." These results did more than set new standards of accuracy. Exceeding estimates for the entire grizzly population south of Canada three decades ago, these numbers raised hopes for the recovery of North America's most powerful icon of the wild to a whole new level. 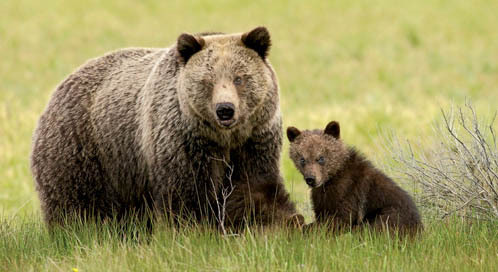 The 600 grizzly bears of the greater Yellowstone ecosystem were declared recovered, and removed from the protections of the Endangered Species Act, in 2007. But these bears are not out of the woods yet. A sizable chunk of grizzly bear habitat is found in six national forests around Yellowstone National Park, making careful management of bears on these lands essential to the continued recovery of the species. The U.S. Forest Service has a clear mandate to protect the bears, and to ensure that recovered populations remain viable and persist over time. But the Bush administration’s deregulation of U.S. Forest Service policy disassembled longstanding wildlife standards, placing the Yellowstone grizzlies at risk of sliding back into the danger zone. 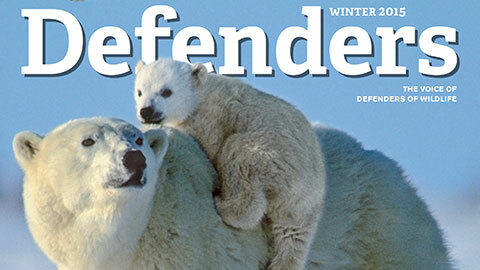 Defenders has launched a project to put the pieces back together again—in the Yellowstone area, and across the country. The Your Lands, Your Wildlife campaign is dedicated to ensuring that the Forest Service and Bureau of Land Management adopt wildlife policies that keep common species common, prevent at-risk species from becoming endangered, and ensure that recovered populations, such as the Yellowstone grizzlies, survive and thrive for generations. Kendall's new grizzly estimates were the result of years of work using an army of employees and volunteers. The team began by dividing the NCDE into a grid with hundreds of units and setting a low-tech bear hair trap in each one: a perimeter of barbed wire strung at knee height around a patch of ground with a scent lure in the center. DNA from tufts of fur snagged on the barbs was used to identify individual bears. I helped Kendall place one of her hair traps near an avalanche slope lush with summer vegetation. She later told me that 37 different bears left fur on the barbs. Researchers put nature's own hair traps to work as well. Grizzlies choose certain trees along paths as signposts, clawing them and wearing the trunks smooth by rubbing as though scratching an itch. A keen-eyed hiker can usually detect a few hairs caught in the bark or sap. By stapling pieces of barbed wire to these rub trees, the team boosted the number of reliable hair collection sites in the ecosystem to 2,800. All told, Kendall's army hiked 18,000 miles, lugged in 80 miles of wire and 2,200 gallons of stinky lure (fermented fish and blood), and brought back 34,000 bear hair samples. From the mass of material, laboratory technicians picked out 563 unique genetic signatures. That represented the absolute minimum number of different grizzlies in the NCDE. Yet Kendall and her colleagues knew they had surely missed animals wary of the fenced traps—youngsters that crawled under the wire, and so on. Consulting with specialists, the team continued analyzing information for another two-and-a-half years and settled on 765 as the likeliest population total. The numbers from the DNA study were higher than many conservationists dared hope. Still, the news wasn't a complete surprise. Because the region is large, rugged and tied to Canadian bear country along the spine of the Rockies, experts have always believed the grizzlies' prospects here were better than anywhere else in the lower 48. And in recent years people in and around the NCDE have reported seeing the bears in more and more places where none had been seen since grandpa's time. I made several trips with bear managers beyond the official recovery area boundaries, following grizzlies ever farther westward into the forested Salish Range and eastward out onto the Great Plains. "Right now, there's one near Drummond [30 miles south of the NCDE] and a female with cubs in the Ninemile area [30 miles southwest]," Chris Servheen, the federal grizzly bear recovery coordinator, told me last fall. "We've even got one wandering past Shelby [a Montana town 60 miles east of the NCDE]. I tell everybody that we'll probably have a grizzly along the Missouri River in 10 or 15 years." But what about the other four populations in the West? At the opposite end of the success scale are the grizzlies of the north Cascades ecosystem in northwestern Washington. The area is similar in size to the NCDE, but the official population estimate is fewer than 20 bears—and the actual number may be zero. Most of the sporadic reports seem to involve a wanderer from the small, declining enclave next door in British Columbia. Two other small populations persist between the north Cascades and the NCDE. The 2,200-square-mile Selkirk ecosystem, which takes in northern Idaho's panhandle along with a sliver of northeastern Washington, harbors an estimated 35 to 50 grizzlies. Another 30 to 45 inhabit the slightly larger Cabinet-Yaak ecosystem at the northwestern edge of Montana. The distance between these two ranges is less than 10 miles in places, separated by the Kootenai River floodplain. Geographically, that's a negligible obstacle. Add the roads, agricultural fields and multiplying homesites, though, and you've got a minefield for grizzlies, considering their risk of getting blown away if they step near garbage, livestock, stored grain, fruit trees, speeding cars, nervous landowners or poachers. Successful movements between the two ecosystems are rare. For that matter, so are movements between the Cabinet Mountains and the rest of the Cabinet-Yaak ecosystem. This worries scientists because they can count the breeding Cabinet females on the fingers of one hand. The good news is that NCDE grizzlies are already pushing west toward the Cabinet-Yaak ecosystem. Several have made it a fair part of the way. One ambled beyond, reaching the Idaho panhandle before being captured and removed for raiding bird feeders. Meanwhile, state biologists have been transplanting a few breeding-age females from the NCDE to the Cabinets to augment that tiny subpopulation. The state also purchased tens of thousands of acres for wildlife habitat and movement corridors from timber companies that had contemplated selling the land for real estate development. In 2007, a grizzly made headlines when it showed up in the east-central Idaho ecosystem, where the last silvertip vanished decades ago. (The visitor was mistakenly shot by a black bear hunter who never expected a grizzly there. Genetic tests indicated that it had come from the Selkirk Mountains.) This former grizzly stronghold includes the conjoined Selway-Bitterroot Wilderness and Frank Church-River of No Return Wilderness—the largest block of protected roadless terrain in the contiguous states. The ecosystem presents such obvious potential for restoring a major population and accelerating full recovery of the species that conservationists forged an agreement with logging companies and other interest groups to reintroduce bears there. The Fish and Wildlife Service sought public comments and received an overwhelming number favoring the project. But in 2001, the incoming Bush administration killed the plan. The Bitterroots lie west of the greater Yellowstone ecosystem, home to the last of the five grizzly populations—and perhaps the best known. Reduced to no more than about 135 in the 1970s, grizzly numbers in this area have increased to nearly 600. The federal government declared this population recovered in 2007 and removed it from the imperiled list. Yet many environmentalists are still concerned about these bears because of habitat loss, the decline of natural foods such as spawning trout and pine nuts, and levels of human-caused deaths that regularly exceed guidelines. Another worry is that this population is the most southern and most isolated group on the continent, which increases its vulnerability to inbreeding, disease and wholesale ecological shifts like those driven by climate change. The solution for Yellowstone's bears lies in connecting them to other groups. "Some people want instant gratification," Chris Servheen says, "but bear recovery is a long-term process that requires constant pressure from growing populations." Those in both the Yellowstone ecosystem and NCDE appear to be on the rise, and Servheen sees the most likely future route between them running through the Cabinets and the east-central Idaho ecosystem. But there's no shortage of obstacles to the grizzly populations' future spread and connection. That's just as true north of the U.S. border. Although both the Selkirk and Cabinet-Yaak ecosystems have connections to grizzlies in southern British Columbia, those groups, too, are fairly restricted in size. Worse, they're increasingly cut off from more vigorous populations farther north by a busy highway, resource development and a growing influx of human residents. Corporations after coal, methane and gold want to industrialize the landscape just north of the NCDE in a part of British Columbia that harbors the densest grizzly population in Canada's interior. Just east of there, decades of continued hunting coupled with a boom in backcountry energy development have left the vast province of Alberta with scarcely 500 grizzlies. Back in the United States, no matter how well grizzlies fare in their high-country strongholds, they have to be able to get from one to the next if they are not only to recover but also to endure for centuries to come. That means crossing lowlands—and those warmer, gentler elevations are sprouting homes for recent waves of new families and retirees. Planning and zoning are not popular in this part of the West, where frontier attitudes linger. The result is a sprawl-for-all. Instead of serving as bridges for animals, more mountain valleys keep turning into ecological fracture zones. "We're not ready to delist the NCDE population anytime soon," Servheen says. "Recovery is much more than a matter of numbers. We have to establish habitat standards. Then we have to achieve them." As the demand for rural real estate expands, so does the work of nonprofit land trusts that negotiate conservation agreements to limit further subdivision in critical areas. Outreach programs such as Bear Aware try to keep the valleys permeable to grizzlies by educating communities about ways to control the attractants that get bears in trouble. And researchers have some new high-tech tools to gauge how the people and bears are responding. For instance, the latest GPS collars placed on some grizzlies can be programmed to record locations minute by minute. "They're telling us exactly how the animals are moving from point to point," Servheen explains. "We're also using collars with a small camera that takes a picture every 15 seconds, showing the bear's environment: roads, buildings, types of vegetation—everything. We'll get huge sets of data we can apply to our recovery strategy." It's a new world out there for scientists, the public and grizzly bears alike. If we can figure out how to share, we'll have made it a better world, where great lives can be lived in full. Montana-based author and wildlife biologist Douglas H. Chadwick is a frequent contributor to Defenders.